In Erica Schmidt’s new play, All the Fine Boys, we travel back in time to a faintly quaint teenage realm of 1980s South Carolina. Her coming of age tale focuses on the contrasting first experiences of love of two fourteen year-old girls. Teenage angst and awkwardness are timeless themes, and the play competently captures these difficult years, even if it is sometimes stilted and veers into uncomfortably graphic territory. 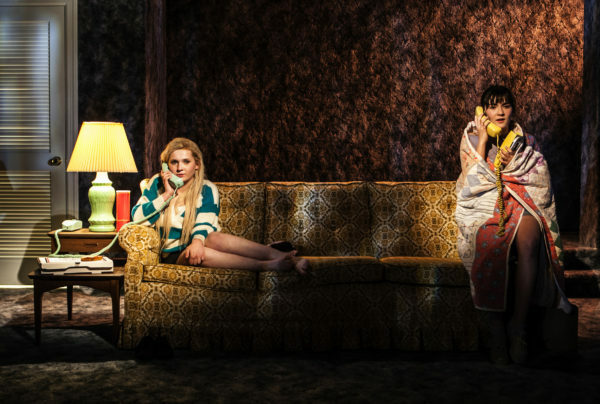 The two girls, Jenny and Emily, are played by Abigail Breslin (Little Miss Sunshine) and Isabelle Fuhrman (The Hunger Games). Although both actors are only 20 years old, they are not quite convincing as teenagers. Their rapid teenage gabble about trivial issues is almost too plausible in that some of it is so fast as to be incomprehensible. The opening scene takes place on the sofa in Jenny’s basement. No cell phones, no social media, just Twizzlers and Pringles and a pile of horror videos rented by an indulgent parent. They lament at length their life in small town USA and the limited diversions it offers. “I’m bored of this town and all the lame boys,” Emily whines. Despite the prospects, what they really want to do is fall in love and they squeal with pleasure as they discuss their crushes. For Emily, it’s an older boy in the school play who’s too cool for school. Jenny has her eye on an older man her parents know at church. Their ideas of love seem naïve and typically teenage. “ How can you wear a guy’s letter jacket and be a vegetarian,” Jenny asks of Emily. But inevitably, they both hook up with their men, although neither of them get exactly what they were hoping for. The simple set by Amy Rubin is dominated by a chintzy sofa that becomes the centerpiece of a series of different rooms. The floor and walls of the set are covered in grey shag carpet – suggesting both comfort and a padded cell in strange juxtaposition. The wall covering gains creepy significance as Jenny is seduced by her older lover. In an odd piece of direction, actors sometimes remain on the sofa after their scene is over. Depending on the scene, a door stage left opens either on a corridor or on a toilet. Both devices seem to slow the action down. Emily’s love interest is a callow youth played with charming wit and wile by Alex Wolf. His performance distinguishes itself by capturing that cringe-worthy stage of adolescence when you think everything you utter is profound and your every move is motivated by raging hormones. Jenny’s man, Joseph, on the other hand, is a 28 year old conflicted churchgoer whose real life will catch up with him. Joe Tippett plays the predator with a creepy awkwardness. Jenny is oblivious to his agenda and is easily swayed by junk food and cheap new clothes. That sofa is the scene of his seduction, played in gratuitous detail, particularly as it’s hard to understand what either of them see in each other. Under Schmidt’s direction, the play’s rendition of adolescent love is convincing and poignant, yet it doesn’t deliver any new insights. It does, however, convey a lost innocence of a world before mobile and internet technology. The girls naivety seems old-fashioned in comparison to today’s teens who may satisfy their curiosity about just about anything on the web and can call and text their friends constantly. It doesn’t mean they are any safer than these fictional girls but they are often more worldly.